PDFs are a ubiquitous requirement in daily engineering life. You might have Purchasing or Sales asking you to send out PDFs of drawings for a vendor to quote or to a customer for approval. Wouldn’t it be nice to set a procedure that would automatically create PDFs for you? First, run the Task Scheduler from your Windows Start menu. Once it comes up, choose the Export Files task in the pane. When the dialog appears to set up the task, click the dropdown arrow under “Export file type” and then choose Adobe Portable Document Format (*.pdf) from that list. 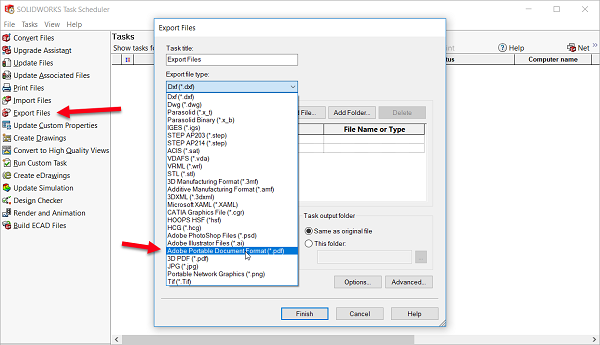 Choose folders that have SOLIDWORKS drawings you want to make PDFs from, and set a time to run the task. Click “Finish” and the task will run immediately, or run at a future time you set. That’s it! You can even set this task to run daily, weekly, or monthly so the PDFs generate automatically. Note that because the Task Scheduler is running SOLIDWORKS in the background to get this task accomplished, you don’t want to run this when you already have SOLIDWORKS running for design work. With any SOLIDWORKS add-ons that require you to log on with a username and password (such as in PDM systems), please set SOLIDWORKS not to turn on the add-ons at startup. If you’re using a floating license of SOLIDWORKS, you may either opt to run your tasks when nobody else is around or set your licenses to not expire immediately after closing SOLIDWORKS. When running your tasks at night, make sure that your IT department doesn’t have a setting which either logs you out or turns off your machine when the task is scheduled to run. We hope you take advantage of this simple way to automate PDF creation. Enjoy! This blog is authored by John Setzer, GSC’s Training Product Manager. John discovered his love of teaching early in life. He worked his way through college as a youth coach, umpire, and referee before earning his bachelor’s degree in education. As Training Manager at GSC, he has been sharing his SOLIDWORKS wisdom with GSC customers ever since – 21 years and counting! John is a Certified SOLIDWORKS Expert (CSWE), a Certified SOLIDWORKS Instructor, and a Certified SOLIDWORKS Technician. As the only CSWE with a state certification in teaching, John is well-versed is teaching all types of learning styles. John is a regular contributor to the GSC blog, available at www.gsc-3d.com/articles.